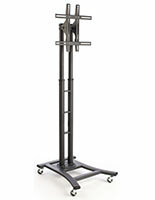 This portable LCD TV stand with wheels, similar to the flat panel plasma mount, is specifically made for large screen presentations. The floor mobile workstation can hold 32" to 84"+ monitors, so the corner television display is compatible with a range of screens. 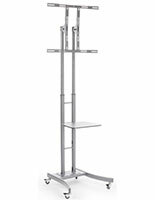 This freestanding LCD TV stand for business use will sturdily accommodate up to 175 pound monitors. 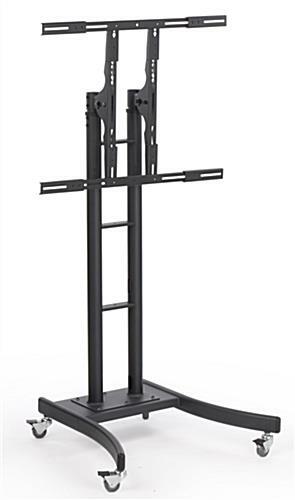 The flat panel plasma mount allows users to adjust the height of the display any of the ten positions between 52.25" and 88" for capturing the most attention possible. 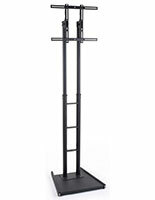 This mobile LCD TV stand with wheels tilts screens to 30° up or down in order to meet the sightlines of passersby. The floor workstation is becoming very popular in all sorts of businesses, such as tradeshows, retail shops, and more! 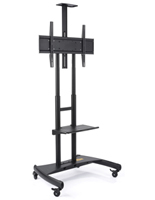 This portable LCD TV stand for business use with locking casters on the bottom moves for easy transport to all areas of the room. Advertisers can set the flat panel plasma mount almost anywhere within the establishment. The corner television display, freestanding LCD TV stand for business use will maintain position with locking wheels. All 4 casters will not move, so users will not have a problem implementing the model in heavily trafficked areas. 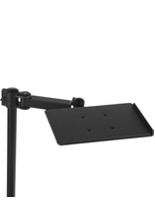 This portable LCD TV stand with wheels includes a MDF shelf for holding goods or providing a work space. The shelf removes conveniently for moments where the shelving is not necessary. 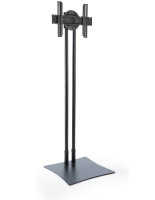 This LCD TV stand has a small footprint, so establishments of all sizes can enjoy the marketing solution. 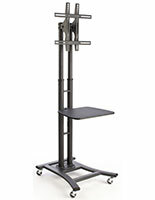 The floor mobile workstation is VESA compatible and includes the hardware for basic installation of screens. 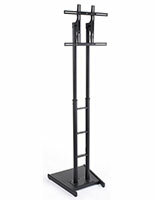 This LCD TV stand is a cost effective way to advertise in all sorts of venues. The flat panel plasma mount knocks down quickly and can be stored away without taking up much space. This corner television display attracts all sorts of people.